Kolkata, January 30: Seems like Trinamool Congress cannot play a healthy politics and especially when they have Bharatiya Janata Party in the opposition. 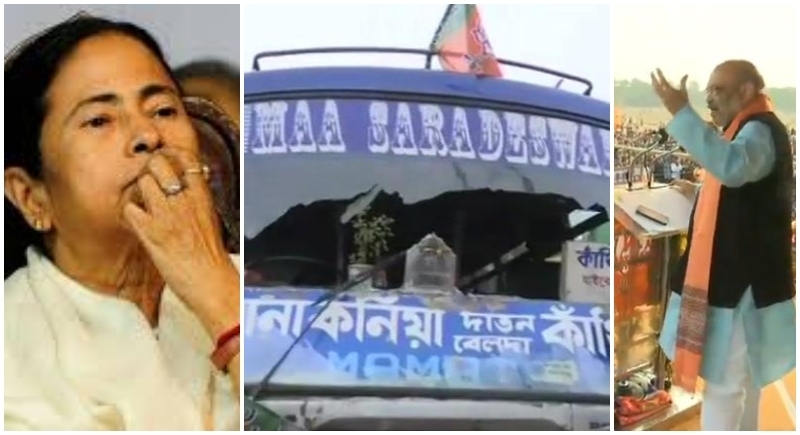 Vandalising buses, creating massive traffic jam, TMC attacked BJP workers just after Amit Shah winded up his rally in East Midnapore on Tuesday. Stooping down once again, TMC’s action aptly sums up that the party does not believe Wes democracy. However, as the BJP workers were returning towards their buses after Amit Shah's rally, a massive traffic jam was created, and the cops failed to manage it. Because of this, the TMC's bike rally could not take place. The TMC workers clashed with BJP workers and the two sides pelted stones on each other and the Rapid Action Force (RAF) had to be called in to control the situation. The BJP has claimed that the TMC supporters were the ones who started pelting stones at the buses carrying BJP supporters. As the situation spiralled out of control, the rapid Action Force (RAF) was called in to control it. The RAF continues to be deployed in the area as tensions prevail. Home Minister Rajnath Singh called up West Bengal Chief Minister Mamata Banerjee and expressed serious concern over the reports of violence, officials said. During the telephonic conversation with Banerjee, Singh asked her to take action against those who indulged in the violence. BJP spokesperson Sambit Patra claimed the state's ruling Trinamool Congress had targeted vehicles carrying BJP workers after Shah's rally. Addressing a press conference, Sambit Patra claimed, “A very worried Mamata Banerjee has unleashed terror on BJP workers and ordinary people. It is clear that she has lost the mandate." Attacking the chief minister, he said she recently held a joint opposition rally in the state for "saving" democracy and questioned "if this is what democracy was all about for her". "Democracy is being murdered in West Bengal. I want to ask parties which attended her rally as to what is their stand on violence against BJP workers," Patra said. Speaking at the public rally, BJP chief Amit Shah assured the people of Bengal that the party would bring back the glory of ‘Shonar Bengal’ and reform democracy relieving the people from the clutches of Mamata Banerjee’s tyranny rule.